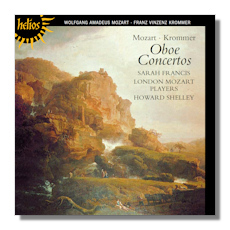 These recordings received excellent reviews when issued about ten years ago and they still are eminently recommendable especially at this new Helios price. Francis is a persuasive and stylish advocate of the Mozart work, this is not the top-drawer composer but the music is catchy and infectious just the same. The soloist finds much vivacity and charm in the Krommer works which use the instrument expertly, especially in the picturesque slow movement of Op. 52 which literally melts one's heart with its beautifully portrayed melodies. Documentation and presentation are stunning for a budget price release and the recording has improved over the original although that is merely slight, this was always an expert Howell/Compton production. Strongly recommended.